Children are known to learn through play, so there are a range of baby, toddler, pre-school and curriculum books available at Baby Brands Direct each designed to be fun and engaging for each stage of their development. Retailers can access a range of books for their store at trade price to suit the learning stage and preference of book type. 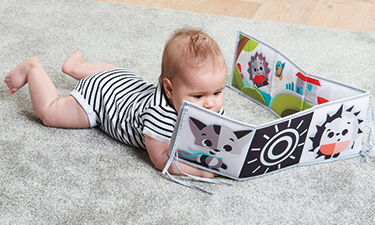 There are books so suit the very early stages of life such as those that also serve as a cot bumper with dual side prints, there are soft fabric picture books with interactive sections such as peek-a boo and added aid such as teethers. There are also electronic books with music and or lights that further help with attention and interaction and encouraging learning through sing along. We also have the award winning LeapReader and LeapStart learning books, recommended by 97% of teachers for its system that interacts with the child talking through activities and offering on page touch points.